Syn. 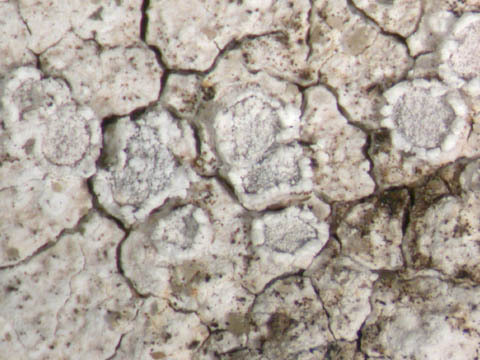 : Lecanora calcarea (L.) Sommerf. On hard calcareous rocks in natural habitats, rarely on sandstone rocks, and on artificial substrata (walls, stonework in cemeteries, etc.). Belgium: Mar. : R, Fl. : R, Camp. : RR, Brab. : AR, Mosan: CC, Ard. : RRR. Luxembourg: Ard. : RRR, Lorr. : R.
France: Mar. : RR, Boul. : RR, Lorr. : R. Lit. : Boul. : 66, Ertz: 18, La69: 105, Mü1: 151, NL84: 12, NL92: 167, VGH: 114, Hoffmann & Van Rompu (1995), Zwaenepoel et al. (1994: 37).